The National Council for Hotel Management and Catering Technology (NCHMCT) (Society) is an autonomous body which was created in 1982 by the Government of India. It is the body tasked with conducting the NCHMCT Joint Entrance Exam (NCHMCT JEE) which allows the candidate to take admission in any of the 58 Institutes of Hotel Management which are affiliated with the Council. The 2019 NCHMCT entrance exam will be conducted by the National Testing Authority or NTA. There are four kinds of participating hotel management institutes affiliated with the Council. There are national institutes, state government institutes, public sector undertaking institutes and private institutes of hotel management. Basic eligibility for admission required is a pass in 10 + 2 senior secondary examination or its equivalent with English as one of the subjects. The upper age limit is 22 years for General and OBC categories, whereas for SC and ST the upper age limit is 25 years as per the last updated notifications. The exam is usually held in the last week of April and the NCHMCT JEE entrance exam results are announced during the third week of May. An application form can be filled online with additional information which is available on the council's website www.nchm.nic.in. The application portal opens during the last week of December. The marking scheme for the NCHMCT exam entails 1 mark for correct answers and a negative marking of 0.25 marks for wrong answers for the Numerical Ability and Analytical Aptitude, Reasoning and Logical Deduction, General Knowledge and Current Affairs and English Language sections. For the Aptitude for Service Sector section the marking scheme is different as more marks are awarded for a more appropriate answer. Here, the most appropriate answer carries one mark, the next one carries 0.75, next to next carries 0.5 and the inappropriate answer carries a negative mark of 0.25. Following are some tips which will help you in acing the NCHMCT entrance exam. A good strategy involves a simple time table made by you. This is an important part of your preparation since it will help you manage your Class XII studies, tuitions and other commitments along with your NCHMCT prep. The time table can be flexible but one should make sure that one always and always makes up for the time lost. 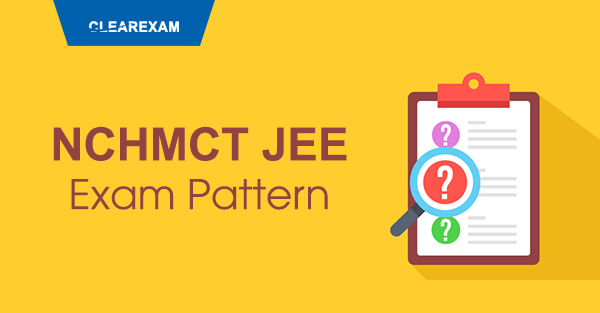 You should be aware of the NCHMCT JEE exam pattern thoroughly so you can gather material accordingly. You should have a personal diary with you. The purpose of this diary is mainly to keep track of your progress. This diary will be a self reflection of how you are performing and progressing. Trust me; a diary like this can make you self-aware more than anything. So basically at the end of every day take out 5 minutes to jot down your prep highlights. Now imitation may be the sincerest form of flattery but I would like to stress upon this point, do not copy your friends and their prep strategies by succumbing to peer pressure. Just because someone is putting in more hours a day than you, it does not necessarily mean that you are on the wrong track. It is extremely important that you remain confident about your preparation strategy. It is important to revise regularly. Our brain works overtime under pressure and it may lead to you forgetting some key concepts which may cost you under the negative marking scheme of NCHMCT JEE exam pattern. Hence with the help of your diary, you should revise your key concepts regularly. This may seem cumbersome and repetitive at first but once you do it for a few concepts you will realise that it hardly takes time to revise those concepts after a while. While revising you may come across some doubts and queries. Once you have gone over all the concepts again and again it is important to start making time for mock tests. These can be online mock tests or previous papers being solved. Again, I would suggest here that you keep your diary updated as to the number of tests that you have solved and the score that you have received. It will help you picture a mental graph of your performance and note your progress through this. After a couple of mock tests, you will be able to identify the sections of the test which consume most of your time. These mock tests help you identify your strengths and weaknesses. Now this is extremely important since it can make or break your chances of getting into a top institute. Knowing which section is scoring for you personally can help you manage your time during the actual test so that you can allocate extra time to the sections which you are not so smooth with. Finally I would advise all of you to be confident and positive about your preparation. Having faith in your preparation will get you a long way since you are the one who is putting in all the hard work and long hours. It is important that you root out all the negativity and de-motivation from around you so that your goal to crack the JEE entrance exam is unfettered. Visualize your goal everyday so that you know what you are working for ultimately. In a nutshell, be positive, know your syllabus in and out, work diligently on a regular basis and be self-aware and true to yourself about your progress and you will crack this test with much ease. Have fun, enjoy your last year of school without compromising on your daily prep goals. And finally, do not worry about what score you will get, as long as you have put in the work and effort sincerely, the results will automatically show. The National Council for Hotel Management and Catering Technology (NCHMCT) (Society) is an autonomous body which was created in 1982 by the Government of India.